Shopping around for a moving company for the best price is the first step in any move. You try to do your homework and look into their online reviews. These are the natural course of research for any consumer, but are you checking to see if these moving companies are licensed and insured? What are the risks and is the seemingly good deal worth it? Hiring An Unlicensed Mover – What’s The Risk? All moving companies that are licensed in California are registered and monitored by the California Public Utilities Commission (CPUC) and required to operate with an active and valid CPUC permit and have proper insurance coverage. The CPUC permit tells consumers two things: a mover is experienced to properly pack belongings and can be counted on to be properly equipped for moving jobs of any size. An unlicensed mover, on the other hand, is not regulated or monitored by any governing agency. If a mover packs up all your belongings in their truck you expect them to get those belongings to a specified location safely. However, what is to stop a mover from taking your stuff and never turning up? For an unlicensed mover, the answer is nothing. If this happens to you, there is nothing a regulating transportation agency can do to help you. Why? They won’t have any information on the company you hired to help you track them down. Hiring an unlicensed mover does not mean bad things will happen to you, but you open yourself up to a huge risk. 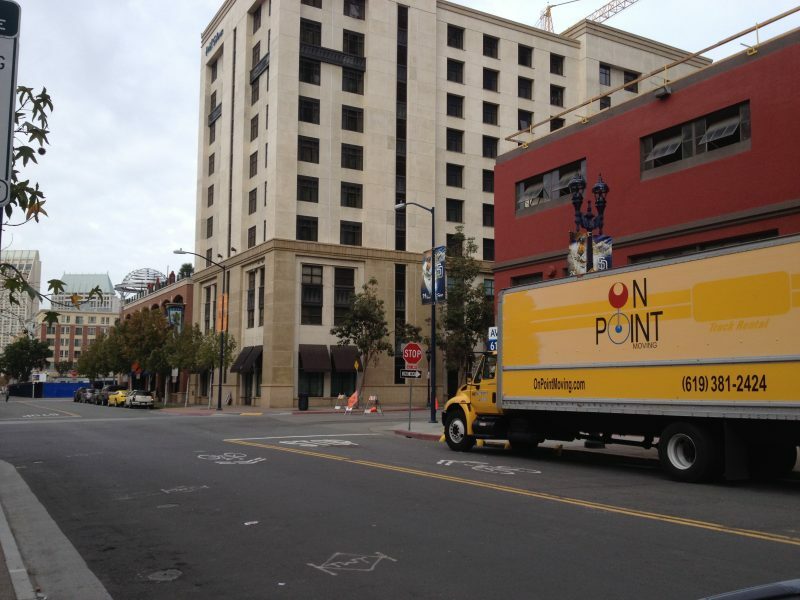 The CPUC has conducted sting operations in which unlicensed moving companies used their services as a front for crime. Some of these moving companies will hold your belongings hostage claiming it was lost or stolen in the course of the move. They then extort you for more money by saying they may be able to recover your belongings for a fee. Some movers have been caught embezzling personal property. They pack up and never turn up with your belonging which they then sell. A licensed and insured moving company will never be able to compete in price with an unlicensed mover. Legitimate moving companies have more expenses they are required to pay for that will not allow them to match prices with their unlicensed counterparts. Remember, all moving companies registered with the CPUC are required to be insured in order to maintain an active permit. 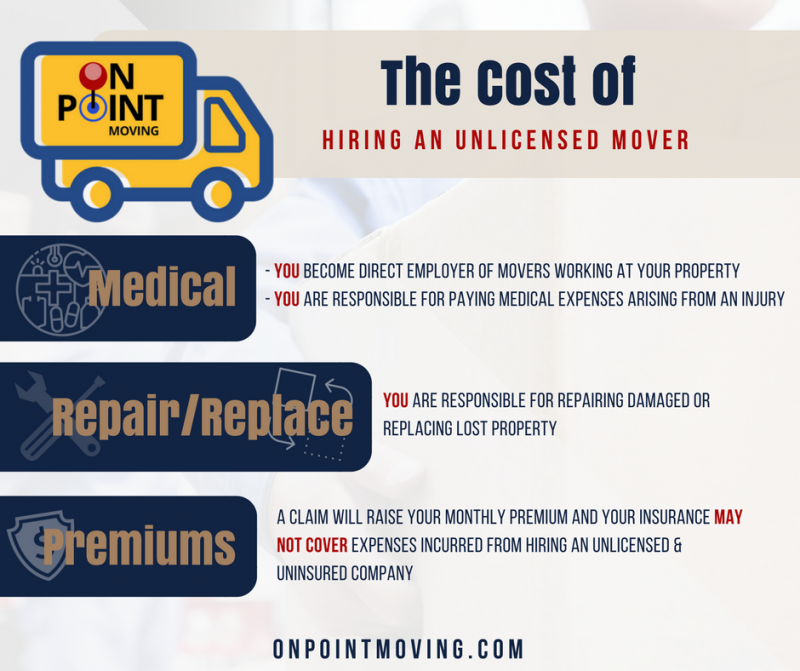 Carrying the required insurance is expensive and adds a considerable amount to a moving job’s overhead making an unlicensed and uninsured moving company significantly cheaper. No matter how careful professional movers work, some level of damage is a reality of the job. Whether it is an improperly packed box, movement inside the truck mid-transit, or a number of other reasons – liability insurance, plus additional moving insurance held by the renter or homeowner, will help cover the cost to repair or replace any damage done during a move. Employees of the moving company are covered by worker’s compensation insurance. If a mover is injured on the job, the moving company will pick up the medical expenses and lost wages as a result of an on-the-job injury. If you are thinking about hiring a company that significantly undercuts every mover’s quote, think of what you are giving up for that price. Hiring cheap may end up costing you in the long-run. Who Pays For Damage or Injury During a Move? Moving is a difficult job; movers are lifting your heavy belongings and putting their bodies on the line for your convenience. What if one of those movers gets hurt on your property? Why? Because you hired an uninsured and unlicensed moving company, you become the direct employer of that injured mover. Accidents happen, but if you hire the wrong moving company, you are on the hook for those accidents. Keep in mind many insurance companies won’t even cover expenses incurred from hiring an uninsured and unlicensed contractor. Check your policy and read all the fine print to understand what you are covered for. If your insurance policy does cover the expenses, partially or in full, you are faced with paying higher premiums because of the claim. You already started researching moving companies by scoping out websites, reading reviews, and shopping around for quotes – but the most important homework you need to do is making sure the moving company you choose is licensed and fully insured. 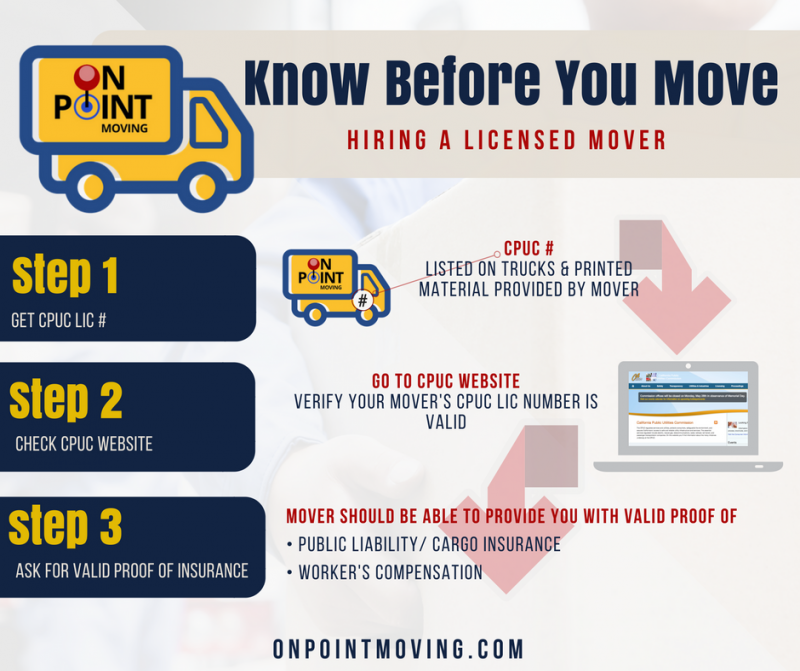 CPUC and DOT license numbers should be visible on the moving truck, company website, and any publication given to you by the mover. If you can’t find it, ask for it. Mover should provide you with their CPUC permit number. Go to the CPUC website and enter license number. Bonus: all legitimate movers will provide you with a “Important Information For Persons Moving Household Goods (within California)” booklet.